Jupiter's moon Ganymede is the largest moon in the solar system. Jupiter is the third brightest object in the night sky, second being Venus and first being the Earth's moon. Jupiter has more than twice the mass of all the other planets in the solar system combined. Jupiter is considered an almost-star. The smallest red dwarf star was only 30% bigger than Jupiter. Jupiter's red spot and the Earth are close to the same size. That means that there is a storm going on in Jupiter that is as big as the Earth! Jovian in English means anything relating to Jupiter — the god or the planet. Sometimes the four outer planets are called the Jovian planets. Jupiter is by far the largest planet in our Solar System: two and a half times larger than all of the other planets put together. It is the fifth planet from the Sun and one of the brightest planets as seen from Earth. Jupiter, along with Saturn, Uranus and Neptune, is sometimes called a "gas giant" because most of these planets are made up of liquid and gas. 2 What is the surface like on Jupiter ? 4 What is the planet's atmosphere made of? 5 What are its moons like? 6 How long is a day on this planet? 7 How long is a year on Jupiter? 8 How much would Jupiter's gravity pull on me? Comparing the sizes of the Sun, Jupiter, Earth, and the Moon. Notice the red spot is about the size of the Earth! Jupiter is 142,984 km or about 11 Earths in diameter at the equator. That makes it about one tenth as big in diameter as the Sun! You could fit about 1,400 Earths into the volume of Jupiter. It is 133,709 km or 10 Earths in diameter from pole to pole. Jupiter's rapid rotation (it spins around in under ten hours compared with 24 hours for Earth) makes it bulge out at the equator. What is the surface like on Jupiter ? Jupiter is a cloudy, windy and stormy planet. It is always covered by a layer of clouds, and wind speeds of 600 km/h are not uncommon. The storms are visible as swirls, bands and spots. A particularly violent storm, about three times Earth's diameter, is known as the Great Red Spot. This storm has been in existence since at least 1831, and maybe since 1665. If the storm has existed since 1665, that would make it more than 300 years old! The stormy atmosphere of Jupiter has flashes of lightning just like on Earth. However, while Earth's lightning strikes may be hotter than 50,000ºC, Jupiter's lightning strikes may go over 5,000,000ºC, which is a hundred times more than Earth lightning, and is more than the temperature of the sun's corona. The lightning is made by water near the tops of the clouds. Gossamer means in English anything that is delicate, light, and flimsy. What is the planet's atmosphere made of? In the outermost layer of Jupiter lie frozen Ammonia crystals. (Ammonia is a compound of hydrogen and nitrogen; its scientific designation is NH3.) crystals. Jupiter's atmosphere is mainly made of hydrogen(H2). Near the surface, there is almost 90% hydrogen. Apart from this, the atmosphere has helium(He). Because of the high pressure, helium becomes a liquid further down in the planet. In addition, Jupiter has methane(CH4)(0.3%), hydrogen deuteride(HD)(0.003%), ethane(C2H6)(0.0006%), and least of all, water(H2O)(0.0004%). Jupiter's temperature is very high. Because of this, scientists cannot tell all the materials the planet is made of. The outer core of Jupiter has hydrogen. The pressure present can make the gas solid. However, because of the very high temperature, the gas melts, and becomes liquid. A simulation of the orbit paths of the moons of Jupiter. Jupiter has 63 known moons. There are four major moons that were discovered by Galileo in 1610, the first moons ever discovered around another planet. Those moons are Io, Europa, Ganymede and Callisto; they are named from characters in mythology closely associated with Jupiter. They are called the Galilean moons. There are often eclipses on Jupiter's cloud tops by the Galilean moons. There are four small moons orbiting inside Io's orbit. That group is called the Amalthea group because Amalthea is the largest one. They are all small and potato shaped. Amalthea is very red. The material of Jupiter's rings came from meteors knocking it off of those moons. Amalthea(Greek:Ἀμάλθεια) in Greek mythology is a foster mother of Zeus. The four largest moons of Jupiter. From left to right with increasing distance: Io, Europa, Ganymede, Callisto. Io (pronounced EYE-oh) is Jupiter's closest major moon. It is 3643.2 km across, slightly larger than Earth's Moon. It has the most spectacular volcanoes in the solar system and molten sulfur lakes. Any craters formed by asteroids hitting the surface are quickly covered up by the volcanic activity. Io's core is made of molten iron and is surrounded by a rock shell. Unlike Jupiter's other moons, there is very little water on Io. Scientists think that when Jupiter was forming, it was hot enough to dry out Io, but not the other major moons. In Roman mythology, Io(Ancient Greek:Ἰώ) was a beautiful young nymph(Nymphs are divine spirits that animate nature and generally portrayed as beautiful young women.) that Zeus loved. Europa (pronounced Eurṓpē) is 3,121.6 km across, about 10% smaller than Earth's Moon. It is made of silicates and has a layer of smooth water ice 10 to 30 km thick. The ice has long cracks in it and very few craters. It looks like the sea ice on Earth. The ice has slid around at the cracks. We believe there is liquid water under the ice as much as 100 km below the surface. There are also some large spots on the surface. In Roman mythology Europa was courted by Jupiter in the form of a bull. Europa (Ancient greek:Ευρώπη) in Greek mythology was a Phoenician noblewoman who was abducted by Zeus to Crete (An island of Greece). Jupiter and its four largest moons, as seen through a telescope. Ganymede is 5262.4 km across, making it 380 km wider than Mercury. It is Jupiter's largest moon and the largest moon in the Solar System. It has plate tectonics like Earth. There are older, darker regions and newer areas with grooves where the plates have moved. Newer craters have bright rays around them from material thrown up by impacts. Older craters look flat and faded because the icy surface does not hold the shape of the crater as well as rock does over long periods of time. Ganymede may have an iron and sulfur core with a silicate mantle and an icy shell. It may be similar to Io except with a layer of ice on it. In Roman mythology Ganymede was a beautiful young man who Jupiter kidnapped and made cupbearer to the gods on Mt. Olympus. The orbit paths of the 4 largest moons. Callisto is 4820.6 km across, about the same size as Mercury. It has many craters. Like craters on Ganymede, the older craters have faded. The largest crater is Valhalla. It has a bright center 600 km across with rings around it up to 3000 km across. Callisto is made of silicates and ice. There is a 200 km thick icy crust with a liquid water sea under it. In Roman mythology Callisto was turned into a bear by Jupiter's jealous wife Juno. Later Jupiter placed her in the stars as The Great Bear. The other moons are smaller in several groups outside the orbits of the major moons. There is also a small moon, Themisto and four groups of small moons that orbit very far from Jupiter. One Jupiter day is about 10 Earth hours long. You have to say "about" because different parts of Jupiter rotate about its axis at different speeds. This is caused by the fact that Jupiter is mostly gases that are in constant motion and sometimes going in different directions. Some efforts have been made to try and measure the rotation speed of the inner rocky core of Jupiter, but that has proved to be quite difficult to accomplish due to the magnetic fields that surround Jupiter and the very active radio energy that is generated by the atmosphere of Jupiter, which interferes with measuring techniques like radar that has been used to measure the surface of Venus and Mars. 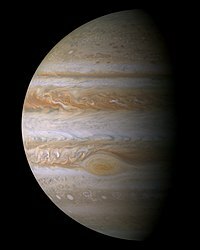 If someone were floating close to the cloud tops of Jupiter, it would pull them down with a force about two and a half times as strong as the force of Earth's gravity. Jupiter's rapid rotation causes the equator to bulge out. This would also cancel out about 10 percent of gravity's force on them if they were at the equator. The amount of this counteraction becomes lower the closer they get to the poles. Jupiter (Latin Iuppiter) is named after the king of the Roman gods, also called Zeus in ancient Greece. The god Jupiter was known for causing lightning strikes on Earth. He is associated with the eagle and the oak tree.